You are here: Home / Recipes / Beef / Man Food: Nachos! The big game is coming up on Sunday and Jeff was in the mood to make some goodies. So thaw out a roast and get cracking on this one. Tomorrow we’ll go over how to make your own tortillas and tortilla chips from scratch! Pre-heat a cast iron skillet to medium high heat. Season all surfaces of the roast generously and when the skillet is to temperature, sear the entire roast, a couple of minutes per side. Transfer to a crock pot and cover. Cook on ‘low’ for 8-10 hours. Shred the meat and set aside. Line a cookie sheet with the chips in a single layer. 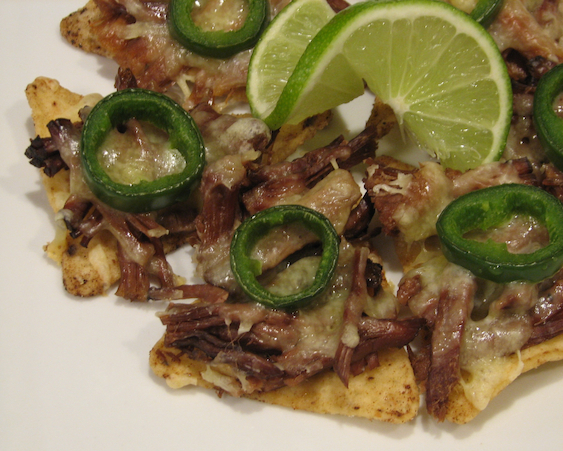 Layer shredded meat on top of each chip. Top the meat with cheese, then a piece of jalapeno. Place the cookie sheet into the oven for 8-10 minutes. Remove from the oven, drizzle with lime juice and serve while hot. From Mess Hall to Bistro, Simply Sugar & Gluten Free, Not Just A Housewife, All the Small Stuff, 33 Shades of Green, Permanent Posies, Tip Junkie and Mop It Up Monday. Oh yummmmy! We love nachos. In fact, I wish I had some right now, lol! Thanks for linking up to Making Your Home Sing Monday!